This post was updated on November 4, 2018 with a recipe video and some new photos. 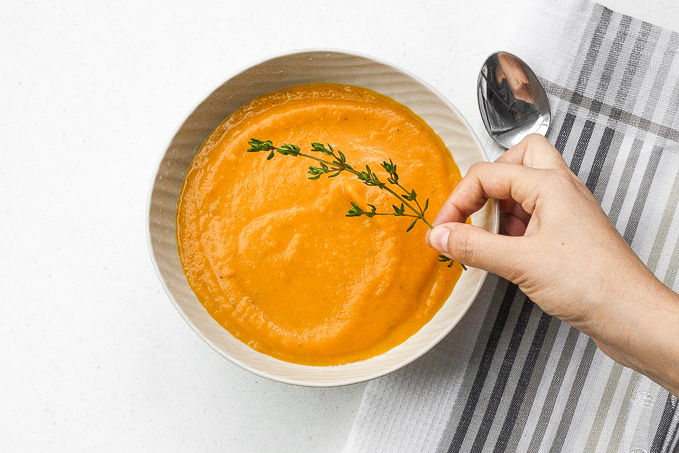 This soup gets some sweetness from the carrots, and it’s got a bite from the cayenne powder, and it’s just all around comfort food… without the guilt! That’s right, this soup is super healthy. It’s vegan, gluten-free and whole 3o compliant. Which also means that there is no cream, no milk, no butter!! Yet this soup has a very creamy and smooth texture from the butternut squash. You really can’t get any healthier than that! I hosted Thanksgiving at my house this year and one of our guests was allergic to dairy. So, I had to come up to with alternative recipes to my usual dishes, including the roast turkey (doused in butter), creamy mashed potatoes (full of dairy goodness) and butternut squash soup. For the soup, I decided to try and make it without the butter and cream and see what happens. Well, what happened was a miracle! The soup turned out absolutely delicious, if not tastier! 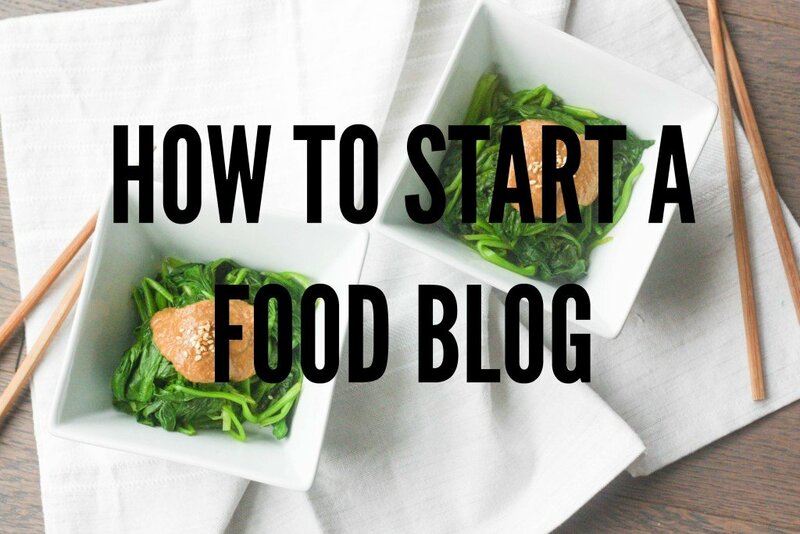 So it is no joke that this is my top viewed recipe on the blog! Step 1: Gather all the ingredients. Step 2: Chop up the vegetables in large chunks. Step 3: Season with fresh herbs (you can substitute with dry herbs if you must). Step 4: Toss in olive oil and roast. Step 5: Transfer veggies to food processor or blender, add stock, and puree until creamy and smooth. Step 6: Pour processed vegetables into a large pot, add more stock, and simmer. Serve with fresh herbs on top! Another reason that I love this roasted butternut squash soup is that you can make it ahead of time and reheat it later. You can make this the day before your big holiday dinner to make your life a lot easier! AND if you can’t finish it all (since this recipe yields a very large pot of soup), just freeze it for later! Then all you need to do on a lazy fall/winter night is defrost and reheat! The Best and Juiciest Roast Turkey Ever – It cooks faster than traditional cooking methods and requires NO brining! 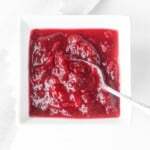 Easy Make-Ahead Cranberry Sauce – Take the stress out of the holidays and prepare easy make-ahead cranberry sauce days before the big holiday dinner! Ready in only 15 minutes! ohh god soup with butternut squash and roasted to I love soups!! thanks for adding one more soup recipe in my list! 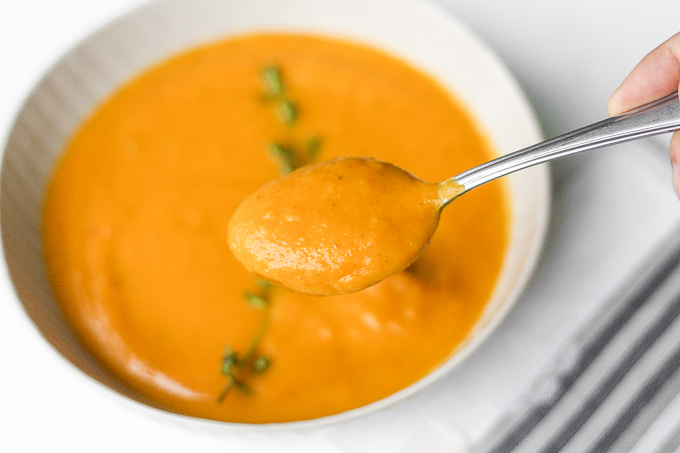 One of the best way to create a butternut squash soup. I would like try in this weekend! This Recipes Help to MY Girlfriend to make Food. My girlfriend now more love me and happy with me. The Presentation and the Recipe is just on another level. that’s amazing. I like the kick of the cayenne but I also add some smoked spiral cut ham to make it a hearty meal. Great recipe that always impresses. Thanks! Yum, some smoked spiral cut ham sounds amazing! I will have to try it next time. Could you leave this in a crockpot to serve and eat off of all day? Yes, you could definitely leave this in a crockpot on warm and serve it throughout the day. Hi! I would love to link your recipe in one of my posts. I’m doing a cooking challenge with my 10-year-old daughter and this soup looks tasty and easy to prepare. This would be one of the options for January’s dish. Would this work for you? Thank you! yumm! 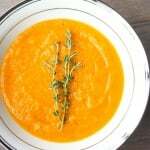 roasted butternut soup this is what I am looking for thanks for the amazing recipe & don’t forget to share with us! Thanks! Glad you enjoyed the recipe! I have never tried it with yam, but I don’t see why not! Your soup may turn out a little bit thicker because of the yam, so just thin it out with some water if that happens. 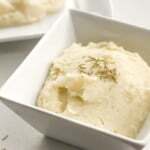 All comments are mentioned that, its delicious recipe. Yes of course its delicious and lovable soup out of the food cuisine Always I will prefer this recipe to my guest . Thanks for the sharing your post. You are so welcome, glad you liked the recipe! Do you have nutritional information for the recipe? I’d like to calculate ww points plus for it. Thank you! Only thing I did different was add some chicken bullion as well. Delicious soup. Wow! I don’t know what type of law you practice but, this recipe should simply be illegal because it is so beyond delicious! Thank you for sharing this with the world, I’m you’re newest and biggest fan! Namaste! I love that this soup has no added sugar! I can’t wait to make this this fall! I love this recipe! Thank you! Using an immersion blender makes it super easy! This is officially my favorite recipe ever. I can’t believe the soup is vegan, it is so creamy and rich! BEST SOUP EVER. Two big thumbs up! Can’t wait to serve this next Thanksgiving and impress everyone. I literally tried this and it was so tasty. Now I am back here to comment here about your recipe. Very much easy to make and so much tasty .. Thank you so much for your share. Made this tonight!! Delicious! Just want to say I originally puréed it in the food processor and found it to be slightly chunky so I put it in the blender and it was amazing! By the way it took way longer than an hour and 15 min and I used thinly cut carrots. Otherwise perfection! The cloves mentioned in directions sound like a wonderful flavor addition. How many? Are they removed after roasting step or puréed with veggies? 5 cloves of garlic, pureed with the veggies 🙂 Enjoy! If I could give this more stars I would! This soup is absolutely fantastic. It feels so indulgent, and yet there isn’t one ingredient to feel guilty about! I have made it three times for my family – once exactly how the recipe states (absolutely wonderful), once with no cayenne but adding a touch of honey (sweeter, still wonderful), and once with both cayenne and honey (WINNER! Sweet and spicy is a magical combo). Thank you for this recipe. It is going into the permanent rotation! My whole family loved this… even with the kick from the cayenne. I served with smoked white cheddar grilled cheese. Perfection!! I am not one to comment on recipes but I really can’t get enough of this soup. It’s in the oven right now for my third or fourth time making it. I made it for Thanksgiving and everyone loved it! My only modifications are I use two celery stocks with a small potato because I am not the biggest fan of celery taste but want to try to keep the same amount of things in the soup. I also use whatever turkey or chicken stock I have on hand. I am trying something new today because my boyfriend requested it. He doesn’t prefer smooth soups so I made a packet of foil in the pan and cut some of the veggies up smaller with some of the herbs, garlic, and olive oil. I am going to throw these in at the very end to chunk it up a bit. Mmmmm…my house is starting to smell amazing! I am probably gonna throw some bacon bits and parmesan in while serving as well to see how that tastes! Amazing amazing amazing!! Best soup ever!! We just LOVE IT !! I did almost fallow exactly the recipe but didn’t have fraîche herbs so i used the dry ones and I served it with a little coulie of maple syrup ( can’t get the Québec out of me ????) . So so so good and no excuses for time consuming cause it take only 15 mins counting the preparation and the mixing at the end !! For my husband who will eat anything but soups most of the time,,, He went twice for two BIG bowls!! I was amazed!! Thank you so much for that simple easy but so flavourful recipe !! So easy to make and it is DELICIOUS!! I really want to make this soup. Just not sure if I want to use chicken stock or vegetable stock. I know it’s a dilemma???? But can you tell me why you chose vegetable stock? It may help me decide what I will do…thanks. Hi Geralann, I chose vegetable stock to keep the recipe vegan. Otherwise, you can easily substitute it with chicken stock. 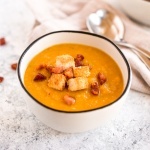 I’ve been looking for a really good butternut squash soup recipe and I think I’ve found it!! This looks great and I can’t wait to cook up the butternut squash from my garden. Since my squash are small…how many cups of squash are you roasting? Hi Jen, I roasted approximately 3 cups of diced squash. This looks delicious! How many servings did your recipe yield? I’m thinking Thanksgiving! Hi Margie, this recipe yields about 10 cups or approximately 6-8 servings. Would this come out ok without onion? I want to serve this at T-day, but a family member is allergic to onions. LOTS of T-day food has onions, so I’m trying to accommodate him where I can, while maintaining the right flavors! I don’t care for celery so I left it out. I never use whole garlic unless it comes from my garden. I use dried minced. No bitter flavor. As for onion problems,check to see if dried onion is okay. Everyone is different,but my family members who cannot eat garlic or onion do fine with dehydrated. If you leave out the onion it will not taste the same sweetness but you could try a little cream orcinnamon at service. I believe squash is food of the gods and one item missing changes it, but doesn’t ruin it. This is delicious! Will definitely make again. I just made this, used 1 qt. Chicken stock instead of veggie stock. Great taste from the roasted veggies. Use caution with the chilli powder, go light and add later if more heat is desired. 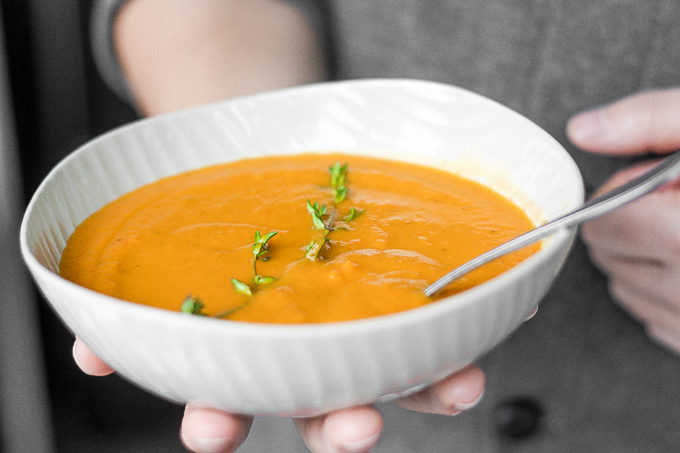 I love roasted butternut squash soup! and you are right with the season! The fresh herbs make it just so much more tastier than when using dried herbs! I made this soup last night using chicken rather than vegetable stock, as that’s what’s I had on hand. I loved it, hubby and adult daughter didn’t. It was really good to me, so I sent some to my daughter’s MIL as she appreciates thick, flavorful soups. Awesome recipe! Totally delicious. 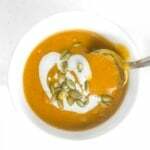 Try adding goat cheese and roasted, shelled pumpkin seeds to bowl, top with soup and enjoy. 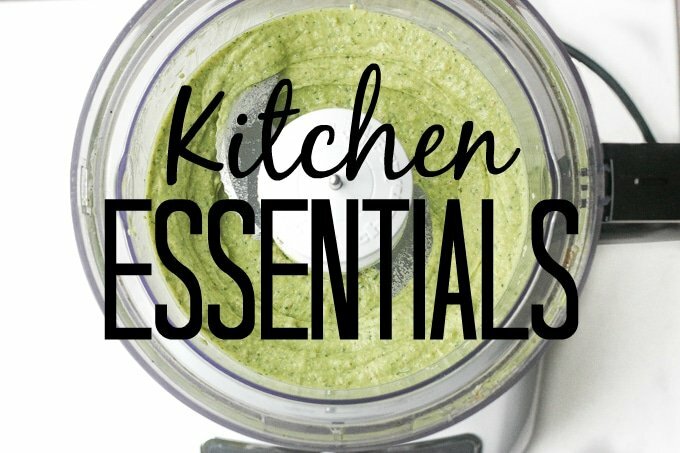 Instead of putting the roasted vegetables in the food processor, can i put them in the sauce pan with vegetable stock and use an immersion blender? Yes, absolutely! I would add half the stock and use the immersion blender to blend. Then stir in the remaining stock. This was amazing! I added some zucchini and parsley to the veggie mix and added a bit of garlic powder and paprika, then used chicken stock as I was South of vegetable, and it came out amazing! Definitely making this for Thanksgiving! Yes! You can freeze the extra ???? Can you use frozen butternut squash instead of fresh? I would normally choose to use a fresh squash, but I happen to have a bag of frozen, cubed butternut squash that I need to use up somehow! I have never tried it with frozen squash, but I don’t see why not! You may need to adjust the cooking time though. Just cut the carrots smaller, and it works perfectly w frozen squash. I used 1.5 bags. Very tasty! I separated the batch in half, and to one of the halves I added one small apple, a little extra cayenne, and some curry powder. It was also very tasty! This is delicious! Thank you so much for the recipe. I was wondering if you had somewhat of an eating of how many calories a cup of this soup would be? On my weight loss journey, I need to track calories and would love to record this correctly! Thank you! Can I use chilli powder instead of red cayenne pepper powder? or is there a better substitute? I could not find any red cayenne pepper powder! I would definitely leave out the cayenne pepper next time. It made he soup way too spicy. This sounds really delicious. I love those herbs you’ve incorporated into the dish. Will have to give this a try this week. Love the vivid colour. This would be great for a fall picnic! I just made this soup for my boyfriend and I, and WOW it is DELICIOUS!! Thanks so much for sharing this recipe! It is definitely one we will be using time and time again! So delicious! Takes a long time to prep but wow is it worth it! Great soup! I may make the same recipe without puréing it. The roasted vegetables alone would make amazing side. The seasons are a perfect combination with the vegetables. I have made this recipe quite a few times and LOVE it! Now that my rosemary has died and I” buying rosemary from the store, I think I”m overdoing it. Can you tell me about how long your spring of rosemary is? I think my storebought ones are just way more abundant with leaves than those in my garden… by the way, highly recommend having it with a gin and tonic or glass of white! Loved this recipe! Creamless yet the consistency is perfect! So yummy and easy to make???????? I loved this soup! I am new to using butternut squash, so this recipe was a nice surprise. Just the right amount of heat. If you used red or green curry instead of red cayenne what would you use? 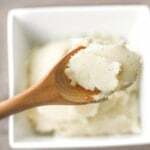 If you used red curry paste would use less than a 1/4 teaspoon or the same amount? Just tried this recipe and I absolutely LOVE it! Delicious and easy to make. I’ll bemaking this quite often this winter! This might also be a silly question but when you say remove the stems of the herbs do you mean to put the leaves and the rest of the herb without the stem into the blender? Yup! Sometimes I find that the thyme stems don’t blend very well and you end up with hard pieces. Do you have a suggestion for cooling it down a bit? I used the 1/4 teaspoon of cayenne, but the bites a little much for me. Any suggestions for what I can add to tone down the spice? About how many cups of butternut squash do you use? I would say once cut into cubes, I end up with about 3-4 cups. 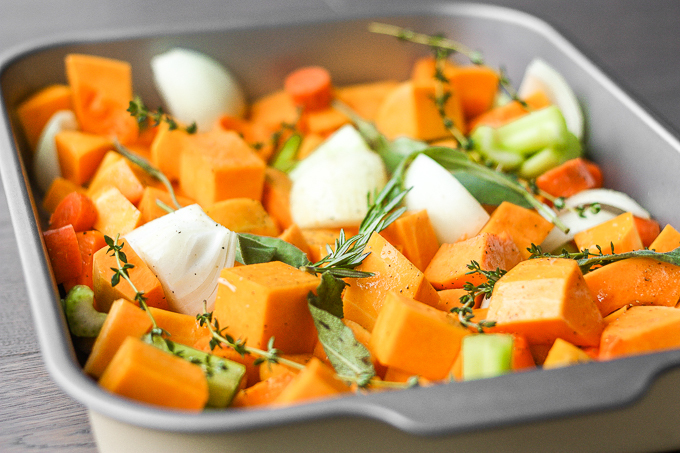 maybe a silly question, but do you roast the vegetables covered or not? I made this tonight for my family, and they absolutely LOVED it. It is very healthy and tastes homey. Thanks so much for this amazing recipe! I will be following you on pintrest for more recipes! One of the best healthy soups ever! I love it. A. It spicy so if you don’t like spice cut the pepper in half. This is amazing! Delicious. The soup is rich even without the addition of any dairy. The spicyness from the cayenne pepper balances the richness. For those that do not like spicy, maybe 1/2 the amount of cayenne. Winner! Thanks for the tip, it was very helpful! This sounds wonderful!! I want to make this for my family. Do you know if this would work well pureed than added to a crock pot? Great flavor! FYI, this recipe takes longer than the time specified.. Sounds amazing! I’m in the process of making it and my carrots and squash are not getting soft. I have it at 350 for an hour? Any suggestions? Can you do this in a crockpot instead of roasting? I have never tried making this in a crockpot but I don’t see why not! Although, I would imagine that the flavour may be a little different, perhaps less intense. Wonderful flavor! Our first butternut squash anything. Loved it! Thank you. Happen to Know calorie count? Making this soup!!! This might be a silly question but do you cover when you roast it or just uncovered? Sounds delicious and I love butternut squash. Do you purée the spices and garlic cloves also? Yes, everything gets pureed. Just make sure you remove the stems from the herbs (especially the thyme). 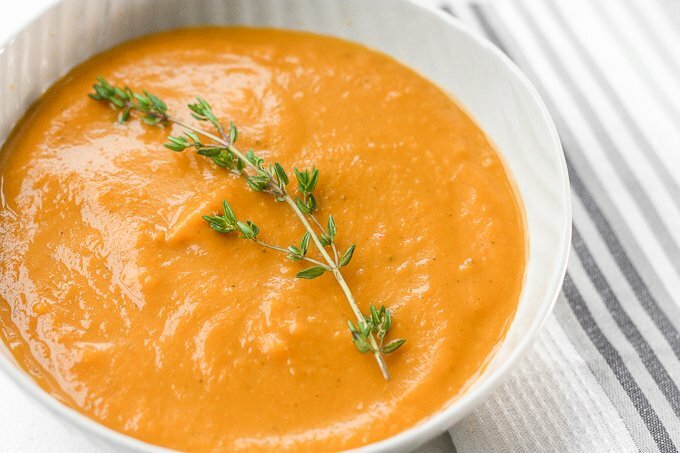 A dairy-free butternut squash soup recipe is a great find! Your recipe sounds delicious and I want to try it for the holidays this year. One question: How large is your ‘large butternut squash’ (either in weight or measurement)? Hi Judy, I would say roughly 2-3 pounds. Thank you! I am going to make it tomorrow!! I had the same problem with the celery and carrots. So what I did was took out the pieces that didn’t outer. Was a very good soup. Easy and delicious recipe! I couldn’t get it as smooth as I wanted to though. It seemed that the celery and onions didn’t purée as well as the squash and carrots. /[email protected] good though! Thanks, Britt! I am glad you like the recipe 🙂 The soup should turn out fairly smooth, maybe try adding more stock when you are pureeing the veggies to help everything blend together. What a gorgeous soup! 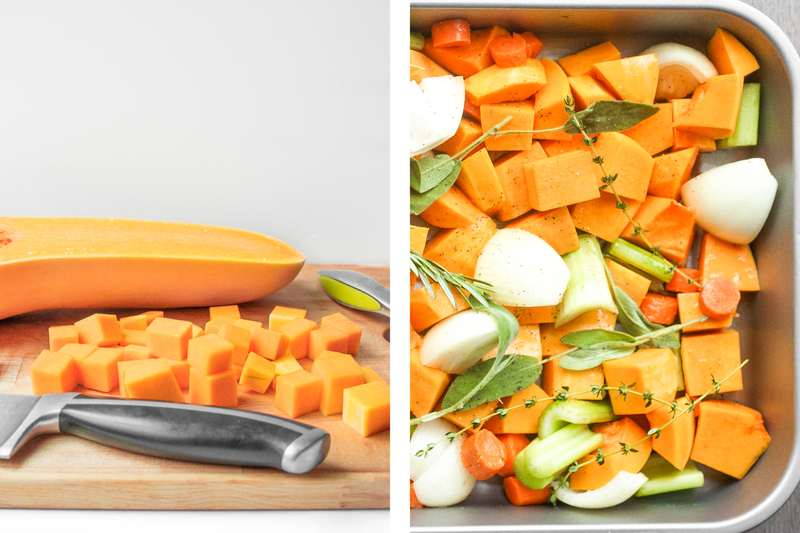 I love butternut squash, it’s such a satisfying flavor, pinning and sharing! Gorgeous! Just the kind of warming soup needed during these cold winter months. 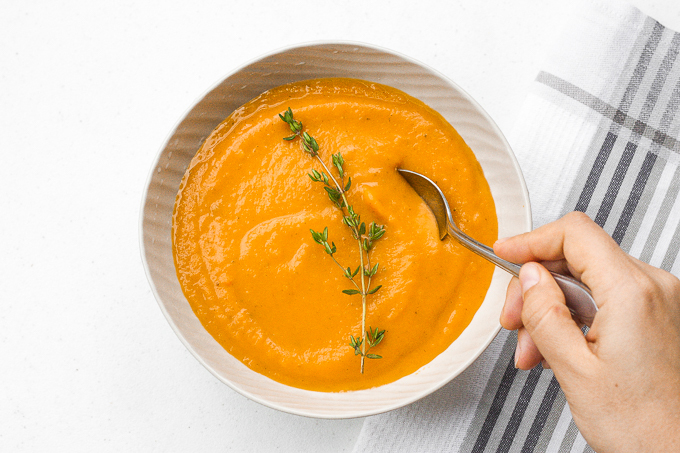 What a gorgeous soup for a cold day – Butternut Squash is one of my favourites, the most velvety soup you can get! Me too, it’s sooo good! I totally agree with you about the health aspect of this soup. Glad you are using sage – it goes so well with squash. Sometimes we use cumin seed, also good. Nice recipe. Thanks for the idea, I will try it with cumin next time! 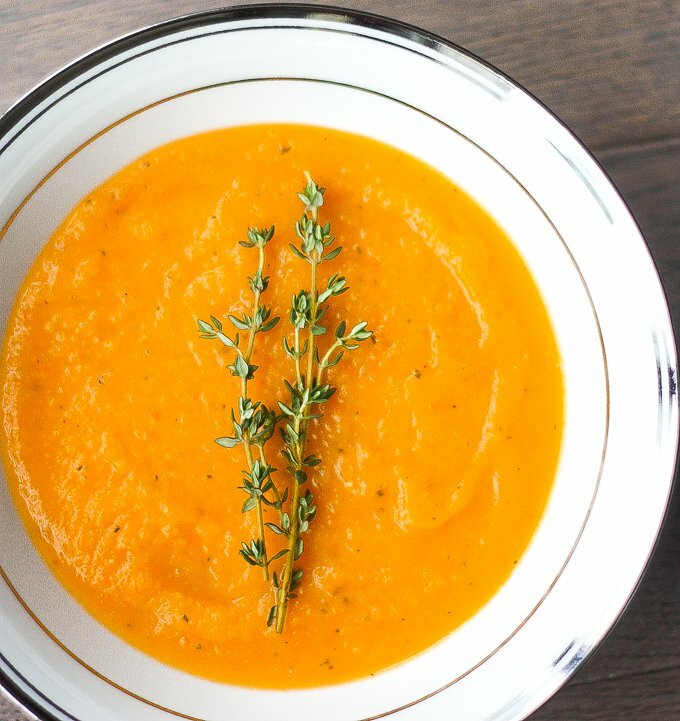 I love roasted vegetables and this soup looks delicious! You are so nice to accommodate your guest’s diet preference – goes to show that you don’t always need the butter, cream and milk! This sounds delicious, and I love that it’s vegan! Sam, this soup looks perfect for winter! Agreed! 🙂 It warms you right up this time of year!